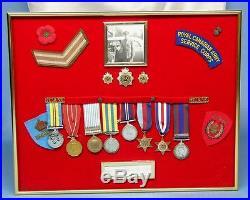 Canada RCASC Corporal WWII Korean War Medal Group w Badges, Pin, Patches... TASCHEREAU SD-144621 RCASC Corporal WWII-Korean War Display Medals: Korean War Named France and Germany Star 1939-45 Star 1939-45 Victory Medal 1939-45 Volunteer Medal UN Korean War Medal Named QE II Service Medal Named Korean War Volunteer Medal Frame measures 16" x 20" Excellent original condition, frame has no glass. Some medals shows old remains of polishing stuff. The item "Canada RCASC Corporal WWII Korean War 8 Medals Group w Badges, Pin, Patches" is in sale since Wednesday, November 30, 2016. This item is in the category "Collectibles\Militaria\WW II (1939-45)\Original Period Items\Canada". The seller is "farbreton01" and is located in Laval, Quebec. This item can be shipped to United States, to all countries in Europe, to Canada.